32nd Milestone in Gurugram has become a destination again with great connectivity on the NH 8. The party scene in Delhi-NCR has been damp for a long time now due to safety and irresponsibility issues but it all seems to be coming back now with people becoming more conscious about safe and responsible drinking and driving. Loft by the Clock Tower at 32nd Milestone opened its doors to the public in February, this year. And they did it with a bang! Initially, it seemed like it will be one of those parties where people would just have a drink and leave since the place was jam-packed even before 9 pm, but things warmed up with the live band, Traffic Jam, singing some brilliant heavy metal numbers. The alcohol and snacks started flowing and the music went from strength to strength, proving once again that any party can come alive with great music, good food and alcohol. Speaking about the Loft’s inspiration, Rohan Kichlu told Restaurant India, “The idea for Loft stemmed from a lot of travelling over the past 8-9 years. The concept is derived from old-fashioned meatpacking and warehousing industries located in New York and Manhattan. At Loft, which is spread over 12,000sq feet and seats around 300 customers, each and every division of the space i.e. The Library Bar, Old Boy’s Corner, The Mad Hatter Dance Floor, The Green Terrace and even he Portico are designed differently to cater to different individuals and moods. 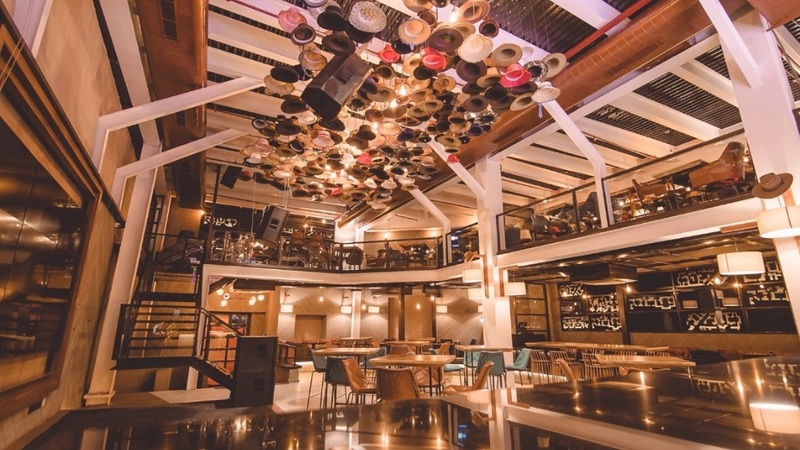 Tribhuvan Yadav and his friend Rohan Kichlu and their childhood pursuit of creating the ideal neighbourhood pubs lead them the second venture into Indian microbrewery world with Loft by the Clock Tower, the first one being The Clock Tower, which is a charming gastropub at Golf Course, Gurugram. With so many corporates now located in and around the area, Loft by the Clock Tower gives people a place to party after work and relax with good food, drinks and music. A few years ago, the place would have seemed really far, one of the reasons why hotels and joints at this location didn’t do quite well. However, with the NCR expanding in a big way, 32nd Milestone has become a destination again due to great connectivity on the NH 8 and people willing to get into their dancing shoes after a hectic day of work. They will have some fabulous live bands like Traffic Jam, to keep the evenings alive in a big way. And the DJs playing at Loft will certainly make the entire setup quite conducive for a fun evening out with friends and family.